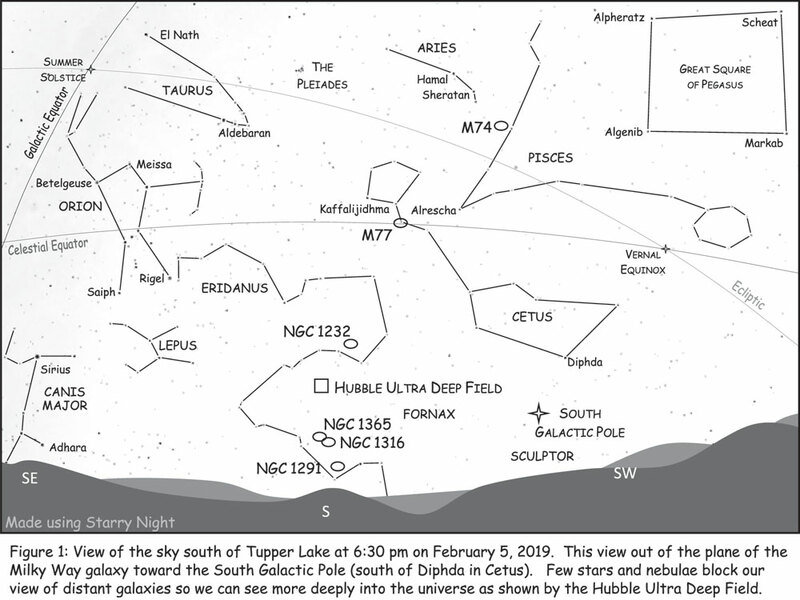 The southern sky visible in the early evening affords us a view out of the plane of our own Milky Way galaxy toward the south galactic pole as shown in Figure 1. There are fewer stars in this region of the sky where the watery constellations of Cetus the sea monster and Eridanus. Cetus is on his way to devour Andromeda (but will be stopped by Perseus). Eridanus represents the Po River that flows eastward across northern Italy from Torino, host of the 2006 Winter Olympics, to the Adriatic Sea. It nearly encircles the constellation of Fornax, the chemical furnace named by the French astronomer Nicolas Louis de Lacaille in 1752. A true son of The Enlightenment, he also named the constellation Sculptor for the sculptor’s studio. It is in this constellation that we find the southern galactic pole. The Milky Way’s disk of a few hundred billion stars is over 100,000 light years in diameter and thick with stars, star clusters, and nebulous clouds of gas and dust. In Figure 1, the galactic equator marking this plane arcs across the top left corner where the rich star fields of the Winter Hexagon constellations of Canis Major, Orion, Taurus, Auriga, Gemini and Canis Minor attract our attention throughout the dark, cold evenings of winter. The thickness of the disk of the galaxy, though, is only about 2,000 light years thick and the Sun is close to the middle. This creates the dark, seemingly uninteresting part of the sky to our south in the early evenings of January. With so few stars and nebulae to block our view, we can see out to the most distant parts of the universe in this direction. 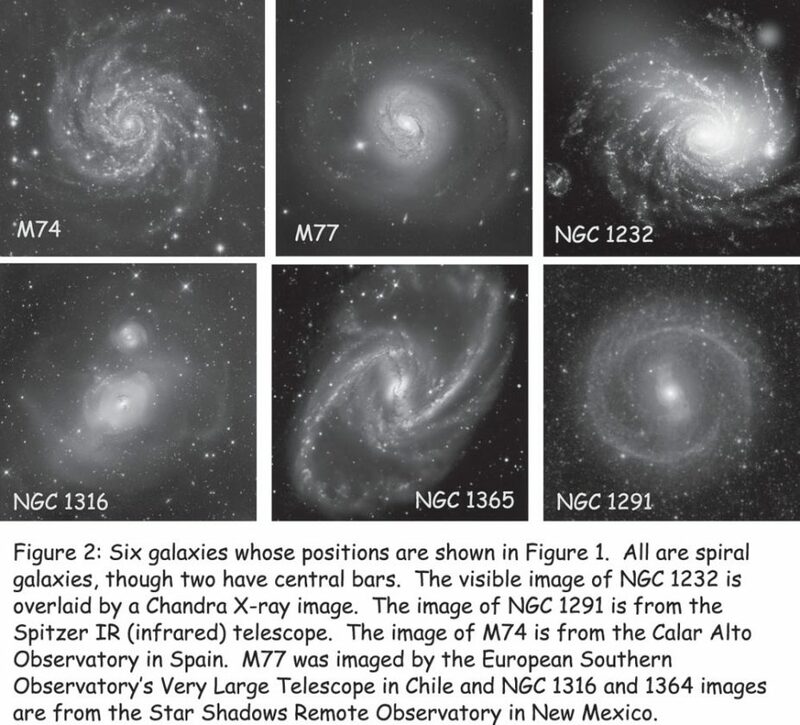 The positions of six galaxies are shown in Figure 1 and their images shown in Figure 2. M74 in Pisces is also known as the Phantom Galaxy because it is a challenge for amateur astronomers to spot in their telescopes. It’s a “Grand Design Spiral Galaxy” with lovely spiral arms filled with star-formation regions. It’s 32 million light years away and the image shown has a width about half that of the moon. The difficulty of seeing it is due to its faint light being spread across such a relatively large area. At a distance of 33 million light years is the galaxy NGC 1291 in Eridanus. Though also a spiral galaxy, it has an inner bar (difficult to see in the small image) whose rotation has caused enhanced star formation in the ring surrounding the inner spirals. The image shown is from Spitzer Space Telescope observations in infrared (IR) that shows gas and dust at cooler temperatures than many stars. Moving farther away from our own galaxy, M77 in Cetus, just south of the star Kaffalijidhma (cough-all-JID-ma) is 47 million light years away. It’s also a spiral galaxy surrounded by some ring-like structures. But this is an active galaxy with a super-massive black hole in its center. Stars, gas, and dust have built up around the black hole in an “accretion disk” and shoot intense radiation out of the galaxy, making it “one of the brightest objects in the Universe” according to astronomers at the European Southern Observatory. Only a portion of the energy from this galaxy is emitted in visible light. It also shines in gamma-rays, X-rays, UV, IR, and radio waves. The galaxy NGC 1365 in Fornax, is 56 million light years away and one of the dominant members of the Fornax cluster of galaxies. Like N77 and NGC 1291, it’s also a barred spiral and, like M77, hosts a supermassive black hole. An international team of X-ray astronomers has determined that the black hole is spinning so fast that, if it had an outer surface, it would be traveling at nearly the speed of light! The inner edge of the accretion disk just outside the “no return” radius of the black hole is moving at nearly this speed. At a distance of 60 million light years galaxy NGC 1232 in Eridanus has bright X-ray emission included in the image in Figure 2. This is emission from gas heated to 6 million degrees by a dwarf galaxy having collided with this large galaxy and causing a shock wave much like a sonic boom. Star formation has been sparked by the disturbance of the shock wave, as shown in the bright region below and right of center near the head of the comet-shaped gas cloud. Just inside the border of Fornax, NGC 1316 is a galaxy 62 million light years away and another scene of cosmic violence as evidence points to a past collision with the smaller galaxy seen above it. The centers of the two galaxies are now about 100,000 light years apart, but the effects of the collision are seen in the vast loops of gas surrounding the galaxies and dust lanes within the larger galaxy that are very small in the image. A quick Google of the galaxy’s name will yield many higher resolution images. This “rogues gallery” of galaxies show the amazing variety and complexity of these giant cosmic objects. But these are just a tiny sampling. The crowning glory of this part of the sky is shown by the small box near the bottom between NGC 1365 and NGC 1232, the Hubble Ultra Deep Field (HUDF). The box is much larger than the actual HUDF, an image created by data accumulated by the Hubble Space Telescope (HST) between September 24, 2003, and January 16, 2004. It shows around 10,000 galaxies in a square 2.4 arcminutes on a side. An arc minute is 1/60th of a degree. Your pinky finger held at arm’s length is about a degree and 4 percent of this is the width of the HUDF image. The image is not included in this article because it really needs to be viewed online to be appreciated. Google HUDF or go to www.spacetelescope.org/images/heic0611b/ to view a high-resolution version. The galaxies are very distant which means we are seeing them very long ago. The brightest spirals and ellipticals in the HUDF are seen when the universe was only about a billion years old … about 8.5 billion years before the sun and Earth formed. The hundred or so tiny, red galaxies are some of the most distant ones ever seen as we see them when the universe was a mere 800 million years old. The universe was a very different place at that time, smaller and warmer with galaxies much closer than they are today in the chaotic early stages of formation. It awes me that this patch of unremarkably dark sky on our southern horizon has afforded us such incredible views of the deep wilderness above. The observers of the Adirondack Sky Center invite you to view some of the nearby galaxies through our telescopes at the Roll Off Roof Observatory (RORO), open to the public on the first and third Fridays of each month approximately one half-hour after sunset. Please come to learn the stars and constellations and view through our telescopes at the Wilderness Above. 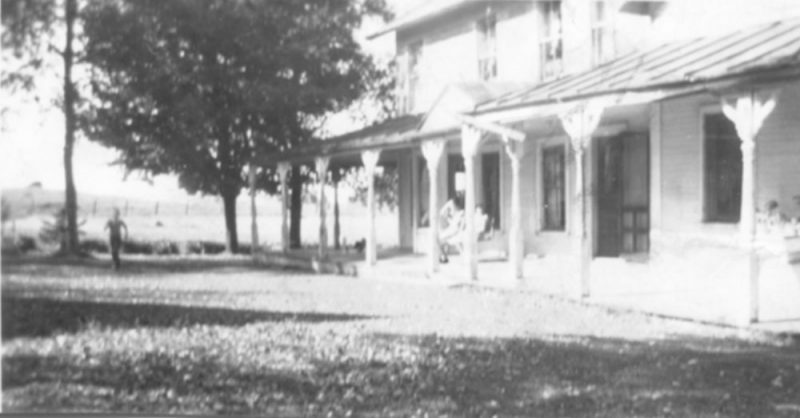 For updates and notices, check out our website at adirondackpublicobservatory.org and our Facebook page. On our public observing days you can also call the RORO at 518-359-6317 to talk with one of our astronomers.